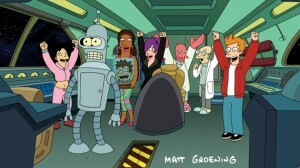 Sad News: Comedy Central Cancels ‘Futurama’!! Bad news, everyone. Comedy Central has decided not to renew ‘Futurama‘ and will have its last episode on September 4th. The final 13 episodes will start airing on June 19th and will be the 2nd half of the 7th season. This is unfortunate, as this Emmy winning series was amazing. Yes, it had seven seasons, but how many times has this been cancelled? I know there is a huge fanbase for the show and is smarter than 95% of what people watch currently. I just don’t get it. The series first aired from 1999-2003 with four complete seasons before it was cancelled on FOX. Then after Adult Swim through the Cartoon Network banner started airing reruns, it garnered more attention. So much in fact, that the cast and crew made four direct-to-DVD movies. Comedy Central picked up the slack and aired these movies in 30 minute increments and billed it as the 5th season in 2008-2009. This was one of my favorite series of all time, and I’m sad to see it go. Even though, there is some speculation that it might get picked up by another network, I’m sure the creators and cast are tired of going thru this cancellation process time and time again. It’s one of the few shows that got a second and even third chance. Maybe Netflix or Amazon will pick the show or up. Or hell, maybe someone will create a Kickstarter campaign and raise finds to make more movies or episodes of the series. This is how I feel with this news. This entry was posted on Monday, April 22nd, 2013 at 10:39 am	and is filed under Film, News, Television. You can follow any responses to this entry through the RSS 2.0 feed. You can skip to the end and leave a response. Pinging is currently not allowed. Shouldn't we call for backup or something?